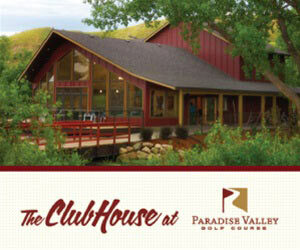 On the banks of the Seven Persons Creek, and just down the hill from Medicine Hat's world famous teepee, the Clubhouse at Paradise Valley features its 'casual gourmet' cuisine year-round. Inspired by the natural setting of the valley, our restaurant has the feel and nostalgic appearance of a mountain lodge. With a central fireplace and dramatic panoramic views, it is the perfect destination for a private meal or group function. It really feels more like a mini-vacation without leaving the city limits. We are dedicated to providing a unique dining experience with exceptional food, service and hospitality. Indulge in our hearty breakfasts or enjoy the daily lunch and dinner specials. Take in the inspiring views of the valley, enjoy the fireplace, or gather with friends and family on our creekside deck and garden patio. Our menu is casual yet diverse, and offers many innovative items in addition to old favourites. Paired with a great wine, local craft beer or your favourite cocktail, you will not go wrong by choosing the Clubhouse at Paradise Valley for your next dinner out or special event. The Clubhouse restaurant welcomes children and families, and invites you to enjoy our "Sunday Family Fundays" where kids 12 & under eat FREE!